Jesus said, "Leave your nets and follow me." 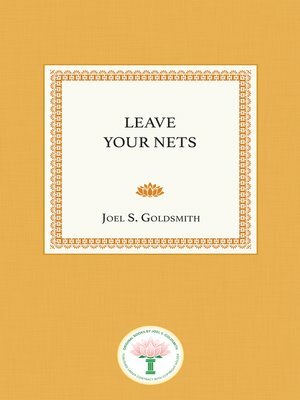 Joel Goldsmith's Leave Your Nets is a similar call to set forth on that great adventure, the journey of the Spirit. This book in no way suggests that we leave our occupations, our families, or other obligations. Rather, Goldsmith sets forth the premise that unless and until we leave our dependency on the material consciousness of things and develop spiritual consciousness, we will be bound to the limitations of human existence. Leave Your Nets shows the reader how to live and work here and now with a constant sense of peace and with greater creativity and efficiency. Goldsmith explains the way to awaken from the passive, hypnotic sleep of the material world to a new, fulfilling and enlightened spiritual world, in which all beings are at one with God and at inner peace with themselves. This book has tremendous value for those who want to accept the call to awaken and become a light unto the world and a "fisher of men."